Now open: The Christmas Stocking Zazzle Store! To listen to the latest episode, just hit play. Scroll the bottom to find past episodes. To subscribe in iTunes or your favorite aggregator, click Subscribe or the RSS symbol in the player..
Watch my Twitter feed, Facebook page and Google+ page for alerts to call to talk directly to me and possibly be on the show! Call right now to reach my voice mail. Call the Christmas Stocking at (323) 487-1225. Or, if you see the Call Me button below, click it, enter your phone number, and Google will connect your phone to my voice mail. Suggest a topic, ask a question, wish someone Merry Christmas, tell me about your celebration! You can keep your number private. Your call could be featured on The Christmas Stocking. If you would prefer the call or email were not used on the show, just let me know during the message; otherwise it will be considered for air. Thanks! Thank you so much to Brian in MA, Paul in the UK, Nancy in NE, Kathleen in MN, David in AZ, and everybody for your generous gift to the Christmas Stocking! Click "Contribute" above to give. Hi! Remember me? I just wanted to finish some things up from the season, let you know how it went, and most importantly thank you for listening and for your support. You’ll always find Christmas at MyChristmasStocking.net. Get in touch at 323-487-12-25 or TopElf at MyChristmasStocking.NET. I’ll keep in touch on Twitter (@XmasStocking), Facebook, and Google+. It’s time for a Christmas story. This one’s really nice. Make sure you’re caught up with all the episodes atMyChristmasStocking.net. 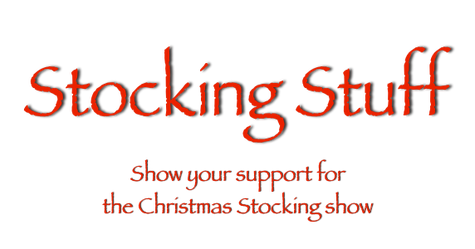 Keep up with the show on Facebook, Twitter(@XmasStocking), and Google+.